Chameleon Clock is an excellent digital desktop clock that changes the look of your standard desktop clock. It is a desktop clock which purpose is to be useful, user-friendly, and beautiful. It is where the power of both features and interface is combined with simplicity. Chameleon uses Winamp skins and bitmap digits to make simple clocks a real piece of art. Chameleon Clock replaces the Windows system tray clock and doesn't take up any desktop space. If you don't want to see it in the system tray, you can always make it float on your desktop somewhere else. The time/date display can appear in thousands of different ways using the popular Winamp "skin" format. The clock comes with a number of sample skins but a much larger number of skins are distributed freely via the Internet and may be downloaded directly from the program, is able to synchronize your computers system clock with major Internet Atomic Time Servers, on demand or on a regular scheduled basis. The alarm feature can alert you using MP3, WAV, MIDI, and CD-Audio sounds, open applications/documents, and shut down your PC at the specified time. Highly customizable clockface - using Winamp skin and digit styles that exactly meet your tastes. Building itself into the taskbar, replacing Windows clock and not eating any desktop space. 100% accurate - by synchronizing the computer's clock with Atomic Clock servers. 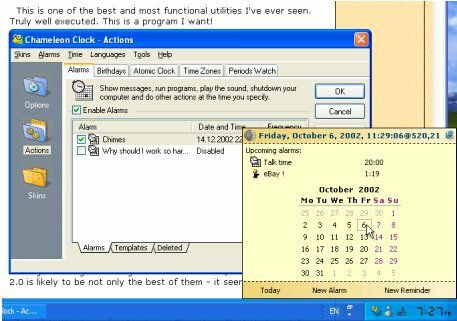 Enhanced alarms - show messages with custom icons, open applications and documents, and shutdown computer at specified time! Play sounds in MP3, MIDI, WAV, and CD Audio formats with Fade In, Winamp playlist support. Talking Clock multilingual feature and showing the current time over the world. Quick access to Julian date, Swatch time, and moon phases in the Advanced Tooltip and the calendar. Advanced tooltip - quick access to any information important for you. Position on top of other windows and screensavers (except DirectX). Enhanced calendar and ladies' periods watch (function that can be hidden from casuals) and multilingual interface support. Support of transparent background, blink colon, date and seconds, 12/24-hours format, and other clockface options. Easy hiding with just one mouse click and restoring with just one mouse movement and support of GoldenSection Organizer and Quick To-Do Pro (packages are available at 20% discount). Complete help system using the latest HTML Help technology for easy searching the answers for your questions.